William of William Cain Fine Art was passionate for the arts from a young age; his mother was an Academy Award-winning artist, and his own travels as a model and actor exposed him to many different cultures and styles. 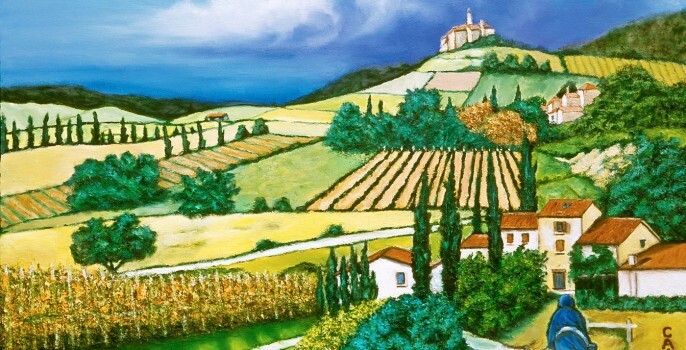 He’s opened an Etsy shop with his Village Life paintings, featuring finger-painted oils and Mediterranean themes. How has your art evolved over the course of your career? What types of art have you experimented with? My mother won an Academy Award for a picture called Lili; she and her husband did the puppets and the puppet work in the film. I was enamored with the arts after being part of that culture. I’ve done fashion illustration, interactive collages, public art pieces, pastels, watercolor and oils. I’m not sure I’d use the word evolved – I challenge myself or simply try something new and see what happens. 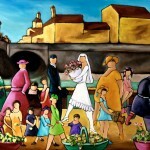 In your Etsy shop, you have your Village Life originals and prints for sale. Do you have plans to make other pieces available on Etsy? I have a series called Project 2, which is a bit more modern or Retro Modern – a mix of fantasy, fashion, Western collages, nudes and animals. I may put it under another shop, I’m not sure. I’m waiting to see what happens with the Village Life Series first. Is there a reason why your subjects remain featureless? I traveled the world as a model and actor for a number of years and it was all about the face. I thought it would be unique to let the viewer of my art use their imagination to fill in the characters. When I paint faces, you might relate to it or you might not – this way, you can put whoever you imagine in the scenes. I do use a few recurring characters in my paintings – the old grandmother, the innocent flower girl, the mother and child. Can you explain why you paint with your fingers and what you are able to achieve with this technique? I started with pastels; I liked the softness of the finished art, and the ability to blend pastel colors together to create totally new colors. I use the same technique with oils. I just like to blend colors together with my fingers – usually two primary colors blended to make 3 or 4 new colors. I also like to get oils all over myself. What’s the process like for creating one of your works of art? I start with a pencil sketch on canvas. I outline the sketch with black oil, then blend my oil colors directly on the canvas with my fingers. I go back and tighten up the outlines (the only time I use a brush) and go over the colors again until I’m happy. I’m usually waiting for “happy accidents” – having the unexpected happen. 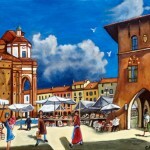 I notice you have shops on Fine Art America, Artist Websites and Zazzle – what’s been your experience with these sites? Would you recommend them to other artists? I think it’s good to put your work out there at different price points and make it accessible to everyone. The main problem with print-on-demand sites (Zazzle, Redbubble, Society 6, Imagekind, Cafepress) is the fees make it difficult for an artist to take a fair markup or sell at a wholesale level. The benefit is that the artist doesn’t have to carry a large inventory or buy an $8,000 printer. There’s a plethora of great artisans around the world, but unfortunately not as many art patrons. You credit your mother as a source of early inspiration – has your daughter followed in your footsteps into the art world? She went into my second love, animals, and has become an animal trainer. 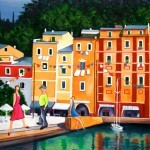 You can follow William on Facebook or see more of his artwork on his blog. We will be looking out for Project 2 on Etsy. Thanks so much for the feature article.Very well done.